Ready for some ooey, gooey, princess fun? This Disney Princess Slime recipe is the perfect DIY boredom-buster craft for your Disney Princess. Over the last several weeks, I have had an obsession with creating fun slime recipes. Seriously friends, this 40-something mom of two teenagers is slightly addicted to slime. Making slime is the perfect boredom-buster. Now that summer vacation is in full swing, this Disney Princess Slime is the perfect way to put the kibosh on the kids saying “I’m bored.” This usually happens about a week after school lets out in our family. I used the same exact recipe as the Pirate’s Booty Slime I shared with you a few weeks ago. I just made it more “princessy” by adding pink food coloring, pink glitter and this really neat pink and purple tiara confetti. I had some pink heart jar fillers in my craft room so I added them too. Make Your Own Disney Princess Slime! 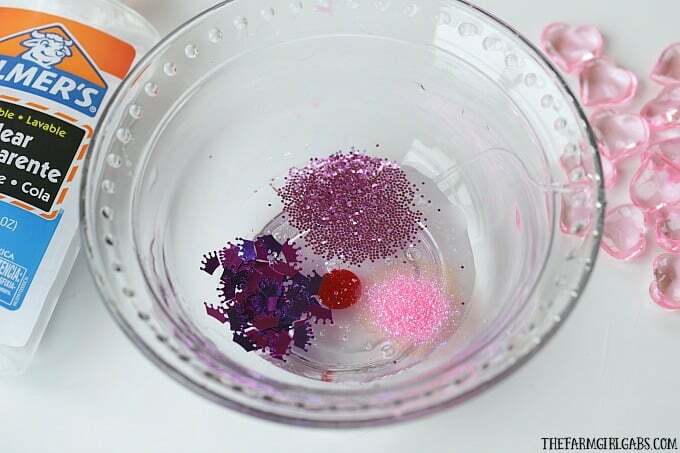 Add the glue, food coloring, glitters, and tiaras to a glass bowl and mix together. Slowly stir in the starch 1 tablespoon at a time until you reach the desired consistency. The more starch you add, the harder the slime will be. Add in as many pink hearts as you want. Make sure you are humming Disney Princess tunes while you and the kids are completing the process. I’m partial to Whistle While You Work , A Dream Is A Wish Your Heart Makes and I See The Light. Hope you and the kids have a magical time creating! Enjoy. 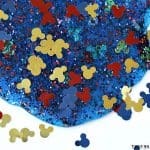 Ready for some other Disney Craft Ideas? Be sure to click here and check out my past posts.